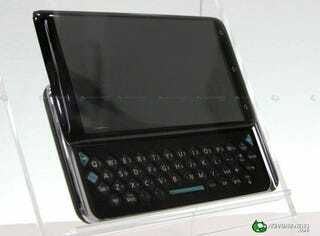 The K01 (shown above) is a QWERTY slider with a 4.1-inch capacitive touchscreen, and is about 15mm-thick. Previous roadmaps suggest it could arrive this year, and will have a 1GHz processor, and 3.2-megapixel camera. Meanwhile, all reports indicate that this is the K02— a clamshell device with a 3.5-inch (800 x 480) resistive touchscreen. Last we heard it had a QWERTY keyboard on the inside (and a secondary LCD on the outside), but as you can see, it's now looking more like a Nintendo DS-style dual screen device. Interesting. It's also tentatively expected early next year. Over at Akihabara, you'll also see pics of the Toshiba L01—a tablet-like slate with 7-inch (800 x 480) screen that also doubles as a digital photo frame. Like the K01, it could arrive by year's end.